Summer weddings are always popular, and never a slow time for our business. 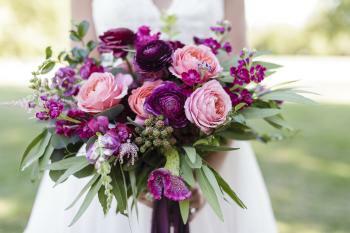 However, what is becoming perhaps an even more popular time of the year for weddings is fall. While there is perhaps a little more unpredictably with the weather, the gorgeous leaves and mild temperatures make fall an appealing time of the year to schedule weddings. If you would like a fall Saturday wedding at a popular venue, those dates are some of the highest in demand. I would recommend as soon as you are engaged to begin thinking about your venue options. Sometimes couples want to take some time to enjoy their engagement before they begin planning. If you know what you want, I recommend going ahead and getting the major elements of your day nailed down before taking a bit of a breather in the planning. Once you have reserved your wedding date at your venue, you will need to begin securing your other vendors. While I know it is a bit overwhelming to think about photographers, caterers, florists, hair and makeup artists and all of the rest of the team who will make up your big day, locking those down as early as possible will help ensure you get the vendors you want. September, October, and November Saturdays are always some of our first days that book. We book some of those days up to 18 months in advance. So, book as soon as you can, but if you are planning a fall wedding closer to your big day, don&apos;t be afraid to ask you favorite vendors if they have availability. Sometimes there are holes in our schedules, or we can recommend other great vendors who may be available. Vendors you love can provide great referrals rather than wading through the overwhelming amount of vendors yourself. While rain or other inclement weather is a possibility for summer weddings, there is a greater chance that the weather could be nasty on your wedding day. Don&apos;t let that stop you from booking a fall wedding, though. Gorgeous fall days can&apos;t be beat, and the temperatures are often milder than the scorching heat of the summer. Just consider what your backup plan will be, if the weather is bad. Will you be just as happy if you had to, say, get married inside instead of outside under the beautiful tree? Hendricks County boasts so many venues with wonderful options for indoor weddings or backup plans. Just be sure you think through how your day will look if you do have to compensate for the weather, and how that will impact your day. One of the biggest advantages of a fall wedding is the ability to incorporate so many gorgeous elements of the season. While your florals are an obvious place to include these details, choosing a location that highlights the beautiful weather, and incorporating elements of what fall means to you throughout your decor, are always great choices. Remember, the weather can be unpredictable. I&apos;m writing this on a late October day as snow is falling outside my window. However, I&apos;m also remembering a mid-November wedding last year that I photographed in short sleeves. 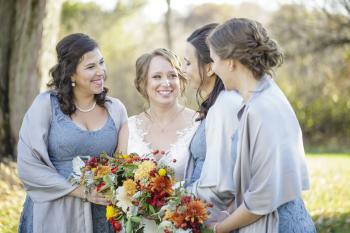 Fall wedding weather can vary greatly, so make sure you have allowed for that with your attire. Perhaps include a wrap for the bride and bridesmaids as an option, if it is cold, and longer dresses instead of short cocktail dresses. Fall is one of my favorite seasons and I love a great fall wedding. If you love fall and want to incorporate it into your wedding, go for it, and enjoy all that it has to offer. 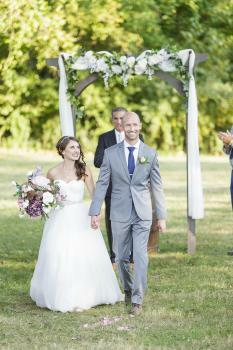 You may not know it, but Hendricks County has everything you need for your big day. In fact, the staff at Visit Hendricks County even created a Bridal Guide and can provide other services to help you with planning that you can find by clicking here.